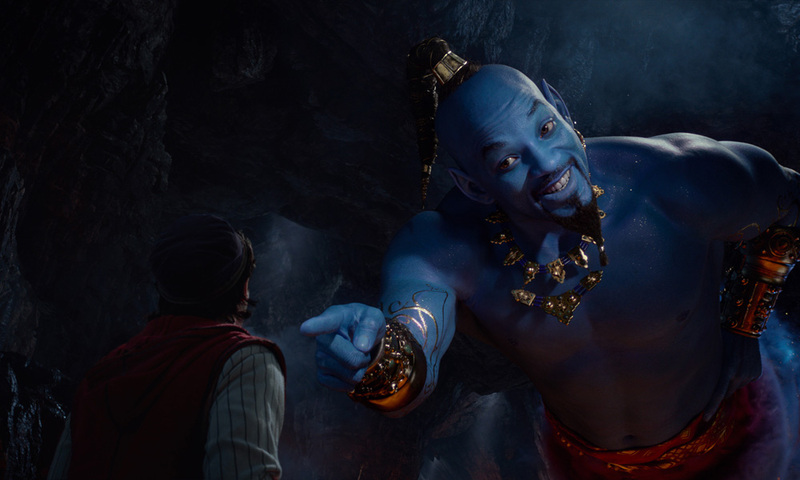 Disney has uncorked the first TV spot for its upcoming live-action adaptation of Aladdin (coming May 24), featuring brand-new footage — including Will Smith’s Genie in action. The spot gives glimpses of the colorful street spectacles of Agrabah, the enchanted treasure cave and all the key cast — plus Apu — before the big lightening cloud reveal of the new digitally-conjured interpretation of the beloved 2D character played by the late Robin Williams. Synopsis: Aladdin is the exciting tale of the charming street rat Aladdin (Mena Massoud), the courageous and self-determined Princess Jasmine (Naomi Scott) and the Genie (Will Smith) who may be the key to their future. Directed by Guy Ritchie, written by John August and Ritchie based on Disney’s Aladdin (1992). The film also stars Marwan Kenzari as Jafar, Navid Negahban as the Sultan, Nasim Pedrad as Dalia, Billy Magnussen as Prince Anders, and Numan Acar as Hakim.